This is episode one of the full ratchet. I am Nick and if you’ve just found the podcast, welcome to this exciting world of startup investing. 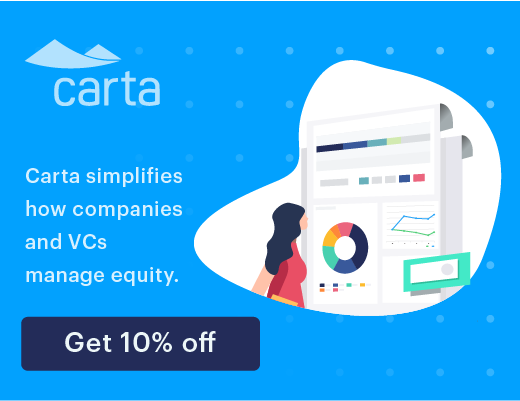 Whether you’re a current investor, you aspire to get involved or you just want to learn more about venture investing… this is where we talk starups from the perspective. Maybe you’re listening to this for the first time, or maybe you’ve heard one of my interviews that lead you here. Either way, thank you for giving it a listen… I’m really excited to be kicking things off. So… why I am I doing the podcast? Well, the reality is that Shark Tank is not how this actually works. It’s very unusual to strike a deal with a startup upon the first meeting and what you don’t see on the show are materials provided to the investors and the hours of negotiation that actually occur. -Who are the Key Players in the industry? 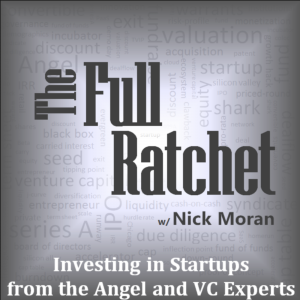 -How are Angels and Venture Capitalists different? -What should one consider when evaluating a startup for investment? -Where do investors find start-ups to invest in? -What are the most common deal structures and when should each be used? In the grand scheme these were just the basics… There are many layers to peel back on this onion and the more I learned, the more questions I seemed have. So, naturally, I started connecting with people in the area that had a lot of experience doing this and it was like the curtain was being pulled back. Like anything, I learned the most by meeting with experienced practitioners and immersing myself in the startup environment out here. Every chat over coffee or phone call was a great crash course in real startup deal experience, So I figured, why not record the meetings and help others like me accelerate the learning curve. Another big movtivation for the podcast were friends of mine. I’ve got a group of friends that have been interested in startup investing always talking about tech and early-stage companies, but never had the right opportunity to get involved on the investment-side with someone they trust. Many are active investors in stock market and while money can be made there, a common critique is that no real value is being created from their investments. So, in the public markets post-IPO, for instance with the NYSE, the majority of value is transfered from one investor to another when a stock is traded… that capital does not get returned to the company to create value or invest in R&D. Where in the startup world, investments go directly to the companies allowing for value creation and growth… so it does afford the potential for a win-win, in that it can be good for the investor and good for the company. typically what I hear are the common stigmas of venture investing that it’s an overly risky, black-box, illiquid asset class that’s just a roll of the dice. And while that can be the case, I’ve learned that there is a discipline to evaluating and structuring investments that has evolved significantly in the past decade and that some practitioners execute very very well. There are also a number of regulatory changes and startup platforms emerging that may fundamentally change both the transparency of information and potentially even the liquidity of investments… of course by liquidity I mean the transactabiliy of investments, ie. investors ability to get money in and get money out of investments. And just like the start-up industry itself the start-up investment industry is dynamic and changing fast, so I think it’s important for us to innovate, learn from each other and try to stay ahead of the curve so that we’re not approaching a modern startup industry with an outdated investment philosophy. This is just a really exciting space to be in. If you’re thinking about getting involved, I promise you’ll never be bored. You get to work with some of the most brilliant, inspiring founders out there… and if you’re disciplined with your approach, you can make money doing it! Now, as a practitioner or a professional investor looking to do this as a career, are going to make the kind of money that big hedge fund managers make or traditional private equity firms?… probably not. The reality is that fund sizes for hedge funds and traditional private equity can be in the billions, where venture funds typically top out much lower than that. But even though there’s not as much money in venture investing industry the way it exists today… there’s still plenty to made as an investor if you make the right bets. And I personally think it’s a much more fun, exciting and inspiring place to be than the public stock markets. Not to mention, how much startup investing has changed due to the pace of innovation and ability of companies to scale. Take for instance GE, which went public in 1896… it took over 100 years to reach its peak in value around 2000 and it is currently trading at a market cap around $267B. Whereas now you have companies like Google, going public in 2004 and at a current market cap of $377B. In less than 10 years and over $300B of value has been created. While GE and Google are not similar businesses, we can directionally get a sense for how quickly companies can scale and grow, relative to their quote “most innovative company” counterparts of the past. -So far, I’ve found many people that are extremely generous with their time and their knowledge and have a great way of breaking things down… and I will continue to pursue guests such as these. In general, whether you run a venture fund, currently do angel investments or you are just interested and want to learn more about start-up investing then this should be a good fit. There’s a wide range of folks that do startup investing from the career Venture Capitalist all the way to the casual angel investor that does this as a hobby for fun. Regardless of where you fit in, the topics we cover should provide value. We’re going to start with the basics and progressively move on to more involved topics while I try and do my best to keep everything in a logical order. As you can expect, you will hear from practiced professionals in the industry and I get their insights into how they do this successfully. In the limited time that I’ve been meeting with folks so far, I’ve been really excited about the lessons and advice that they’ve shared with me… so I hope that resonates with you too. My objective is to help you find more opportunities, size them up quickly and have great confidence in both your yes’s and no’s. If you’re losing sleep because you’re unsure about an investment, I hope we can help you move forward or move on from an investment, confidently. And by facilitating, I, myself, plan to keep learning and improving in these areas as well. Of course, there are many interested in startup investing but don’t have the time or interest in sourcing and structuring deals. If this is the case or if your strategy is to find someone who does this professionally and has a compelling approach, you will get exposure to a wide-range of practitioners and venture fund managers that I have on the show… each with their own unique philosophy on early-stage investing. You’ll hear this phrase in the venture investment world, “we bet on jockeys, not horses.” Essentially they mean that they’re prioritizing team and the founder moreso than the technology or market. And there are some that want to go a level above that. So, staying with the horse analogy, they want to bet on the trainer instead of the horse or jockey… because the trainer is selecting, coaching and developing both the horse and jockey. So they’re looking for the Bob Bafferts or young, innovative trainers of the world to align themselves with. The real message here is that regardless of one’s personal investment strategy… whether that be direct investments or a venture fund, we will cover how to do each so that we’re avoiding the shotgun approach and employing more of a rifle strategy. Alright, so what not to expect… Recommended investments… I’m not going to tell you specific startups to invest in or urge you to make an investment. The decision making is yours and yours alone… we’re just cover the tools and the thought process that should inform those decisions. I am a full-time startup investor based in Chicago, Illinois. My wife and I moved back here a year ago after spending a number of years moving around the states for my job. So, I’m just coming up on a year of doing this full-time and couldn’t imagine doing anything else. Previous to this I did Product Development, management, strategy and mergers and acquisitions for a large, aggressive multi-national firm. In the future and coming episodes we may get more into my background and how it drove me into the startup investing space… but the short answer is, while I was there, I learned an involved process for evaluating early-stage companies and technology and really wanted to apply it for myself. My brother an I have a small family-fund called Moran Capital Partners. He’s an IP and anti-trust attorney here in Chicago… which helps tremendously when evaluating the patent-side of things with startups. And, in general, we focus on early-stage companies where we typically invest between $25k and $100k. And in certain instances where there is a deal that appeals to our network of high-net-worth, interested investors, we allow them to tag along at our negotiated deal terms. I have to mention that I’ve never done a podcast or hosted any type of show for that matter, so bear with me on the technical issues and challenges early on. I hope this is fun, conversational and informative… and I am committed to getting great guests to discuss valuable topics for us all. there you will find a link there where you can suggest speakers and topics for the show. Or if you are a practioner and are interested in being interviewed, don’t hesitate to reach out. Also on the website, you can also sign-up for my weekly newsletter. I promise not to spam you with e-mail… just a once a week letter of valuable info on venture investing and the show. So look out for my first interview on the topic of “Intro to the Venture Industry” with Chris Yeh of Wasabi ventures… should be a great guest to kick things off and I hope you give it a listen. That’s it for now. Thanks for listening and always remember to over-prepare, choose carefully and invest confidently. See you next time.